Ergobalancer BA series is a pneumatically driven balancing system. It lets your load “float” in the air so that with minimal force, you can lyft, turn, rotate and place it quickly and exactly. It is so simple and logical to work with, that anyone can learn to do it within minutes. 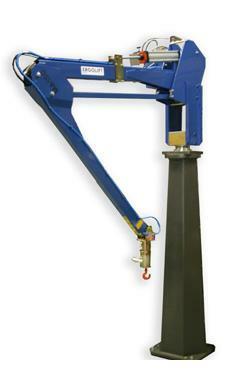 BA has the same arm system as the hydraulic MA series and can be fitted with all our standard gripping tools. Installation either on a floor pillar or hanging from the ceiling or a trolley system. An automatic brake stops the arm from moving out of control if the load is dropped or handled wrong, or if there is a machine breakdown. Safety valves hold the arm and the load in place in case of power failure or pipe leakage. Manual balancing means that you set the work piece weight manually, and Ergobalancer then keeps balancing that weight. This works well for example for installation, where you might want to handle a heavy work piece very exactly by hand. Automatic balancing means that Ergobalancer feels the weight continuously, and compensates for it. Automatic balancing is most helpful if the weight changes, for example when filling or emptying a vessel.